After all, no doggie treats were involved. She and Kirby are getting along much better. He seems to have accepted the fact that she is not going away and is practicing tolerance (most of the time). Several times he has completely forgotten himself and started to play with her, but he quickly comes to his senses and begins to ignore her again. Hester has become so comfortable with her new home that she has even started to get into a little trouble. Although well behaved the first week or so, she has proceeded to completely demolish the wicker basket she was sleeping in and started chewing on anything else she can find at night. Today we bought her a crate and she is quite happy with it. She hopped right in and went right to sleep. So no chewing for her tonight. A Happy Easter to everyone – we’re having a family get together with younger son and my sister. Wish you were here Ben and Abby! Less than a month to go before the baby – we are all getting very excitied!! Is it possible that there will be peace in our lifetime? The lion will lie down with the lamb. The Arab and Israeli will be friends. The Serbs and the Croats will make peace. The Republican and the Democrat . . . . . Nah! Too unlikely. But we do have this . . . . . This was not staged! It was entirely voluntary. Hester jumped in first and Kirby followed. 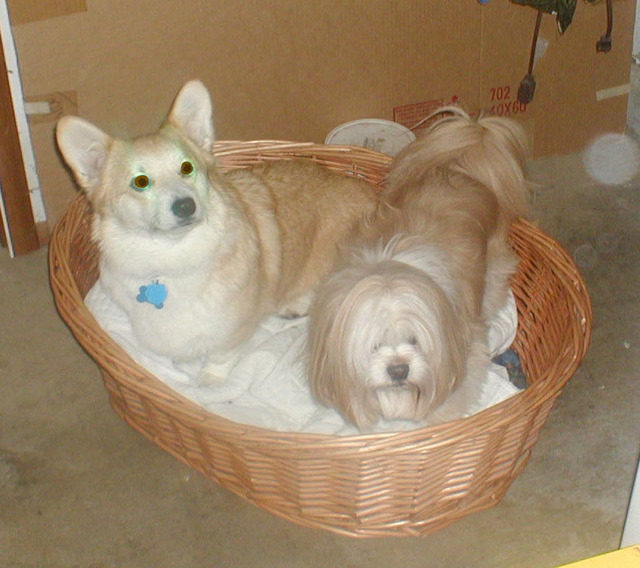 We immediately rewarded them with a biscuit and then Kirby realized the enormity of what he had done and jumped out. He then resumed his normal pattern of ignoring her until she got too annoying and then snapping at her. But there is a ray of hope. They spent the night in the same room last night and there was no bloodshed, so we are making progress. Before you get too jealous, Marguerite, this early spring comes at the price of a severely low snow pack. 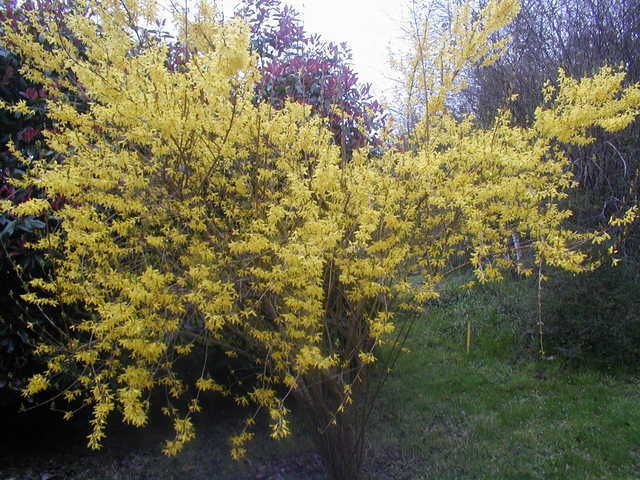 They are predicting drought for this summer, we will be paying for all this beautiful color. I was thinking even as I took the picture that I was still disappointed that you couldn’t see the pattern developing. But I was surprised when I viewed the picture that you can see it quite well. I feel a little bit like I’m working blind. the only thing that I have to tell me that I’m doing ok is that the stitch count comes out correctly. 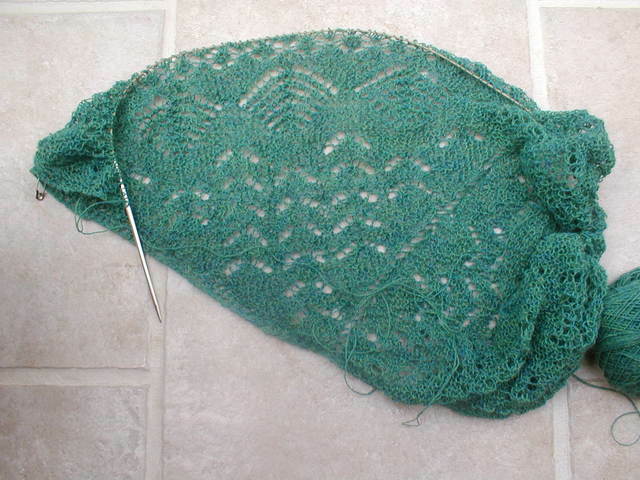 I am not particularly liking working lace on such big needles (size 6), but I think I will be happy with the outcome. It’s coming along fairly quickly – I’m at the next to the last pattern and then just the border to do! After the Mediterranean Shawl, this border will probably seem very quick! I hope! We picked up Hester on Tuesday. On the 45 minute ride home, she calmly gazed out the window and then laid down and went to sleep. She is truly the sweetest puppy – very calm. If we had to choose one word to describe her, it would “lady”. She has settled right into our routine at home and learned to use the doggy door and so far only one accident inside. 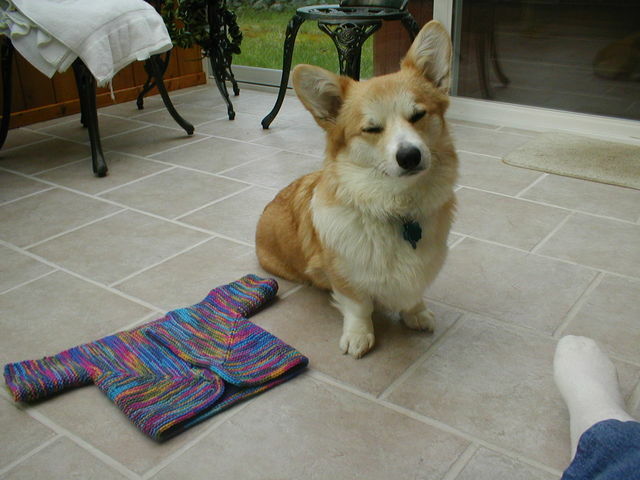 Kirby, on the other hand, is NOT pleased, as you can see from the picture. That is definitely a doggy pout. 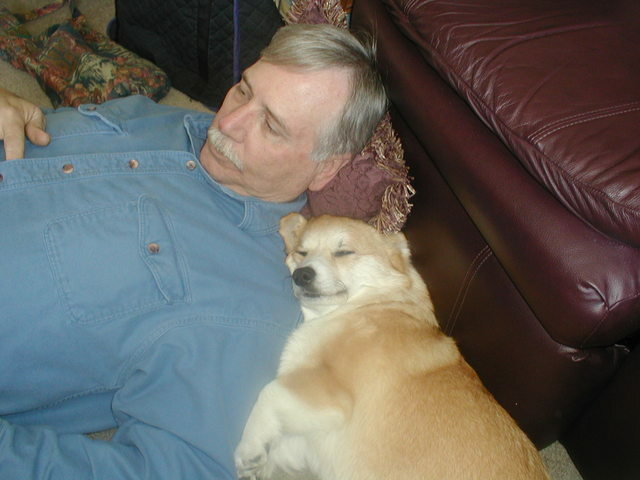 For the first four hours he barked at her every time she moved – gave me a splitting headache! Now he’s decided that since yelling at her has not driven her away, he will try ignoring her. He will not even look her in the eye. Hester, on the other hand, has decided to be more proactive. She’ll go up to him, bump him with her nose and then flop over onto her back to say, “See, I’m not a threat – you can still be top dog. But can we play?” Kirby will have nothing to do with her. She’ll keep persisting until he gets annoyed and chases her away. Then she’ll sit across the room eyballing him for awhile and then start all over again. I think she will wear him down eventually. I started another Surprise Jacket, this time in a worsted weight. 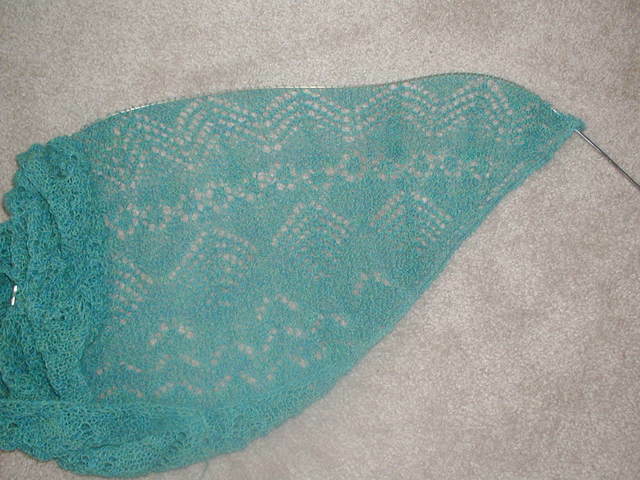 I also worked a bit on the Pacific Northwest Shawl, but no progress pictures that are the least bit exciting. This weekend will be taken up cleaning and studying for the most part, so I don’t expect to have much more to show. But maybe more cute puppy pictures! I had a great time this weekend at Camp Knitaway. This retreat is held every year on the mainland and this was my second year. Nothing to do but relax, knit and eat! 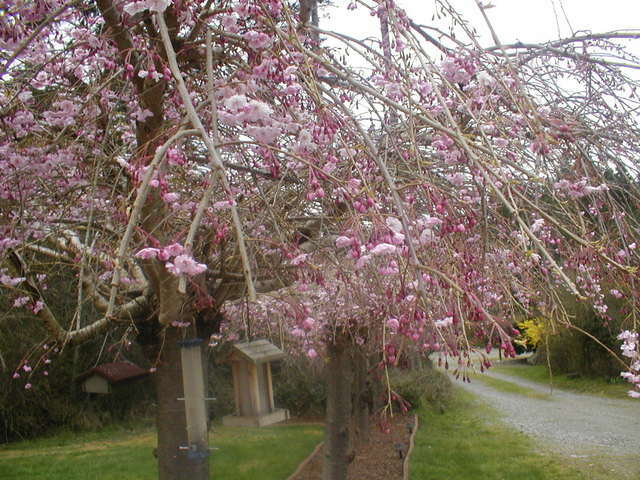 All meals are provided and the rooms are nice – four of us from Whidbey Island shared a small room and bath. This year the teacher was Chris Bylsma and she taught her Crayon Box Jacket technique. I have to admit going with a bit of a closed mind. I was just going to sit and observe – the jacket is pretty funky artsy with lots of novelty yarns –not my usual style. But I have to admit to enjoying the class very much. I did make the sample (will post a picture when it’s completely done) and liked it so much that I ordered the pattern for her poncho. Just goes to show it’s never too late to learn a new trick or two. 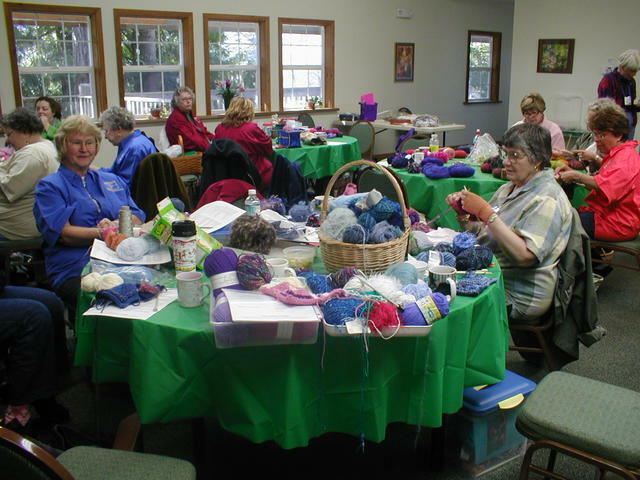 I loved coming in from the outside and seeing the tables crowded with yarn – so colorful! During get acquainted time one elderly lady introduced herself and said that she had been knitting for over 50 years and back in the 80’s went to a knit camp in Wisconsin. She didn’t know if we had heard of this woman – Elizabeth Zimmerman! A collective gasp went up from the crowd. I have actually taken a class from her daughter, Meg Swansen (a little shameless name-dropping here). In fact, while we’re name dropping, for living in a remote corner of the Pacific Northwest, I’ve been able to rub shoulders with a lot of famous knitters without leaving the island – Lily Chin, Eugene Bueghler, Priscilla Gibson-Roberts, Nancy Bush to name a few. The ironic thing is that as knitting has grown in popularity, the big retreats on the island have died out. A lovely skein of Mountain Colors wool for a pair of socks (plus pattern) and this gorgeous!!! 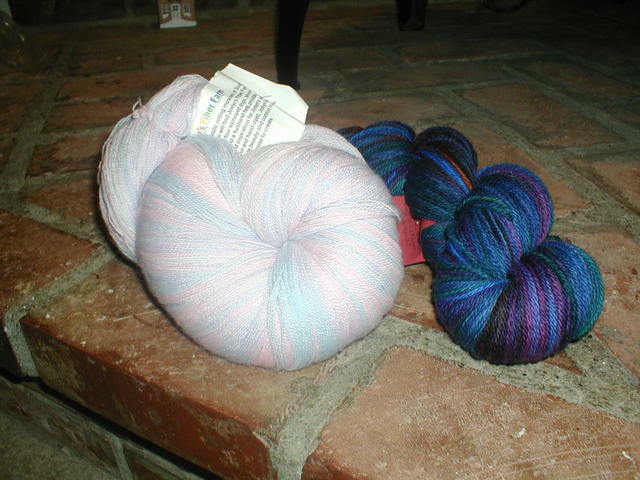 pink and blue lace yarn. Although the gift exchange was random, the lady who brought this said she thought of me when she brought it. She was right on target- both the color and medium. 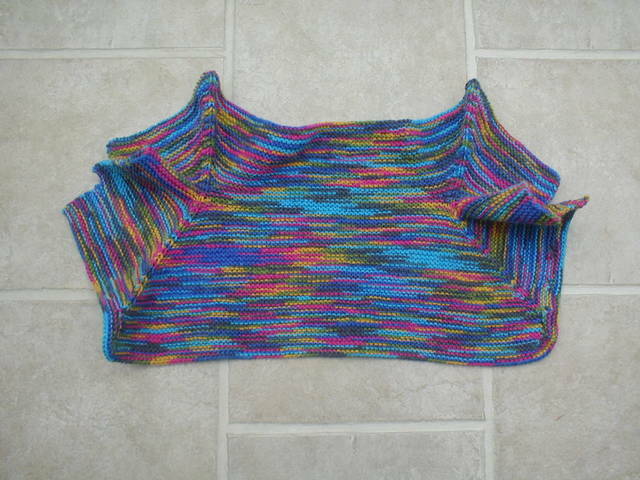 Also included was a pattern by Mary McCall for a shawl based on EZ’s Pi are round shawl. I think I will use it with this yarn, but with some adaptations. The pattern calls for size 9 needles and the finished product is 9 feet across (yikes!!). I know the theory is that if you use larger needles with lace you get a lacier effect, but I just don’t like the process with larger needles. So I will use about a size 3 or 4 and get a more manageable project. 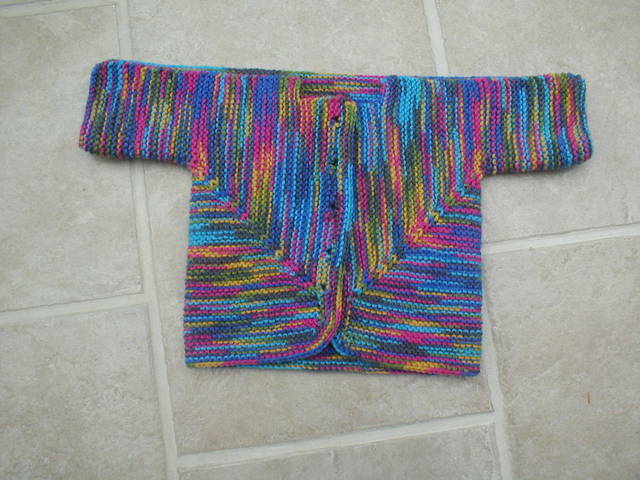 A baby surprise jacket for Izzy. I can’t believe I’ve been knitting for so long and been such an Elizabeth Zimmerman fan but have never knit one of these. What a fun knit! 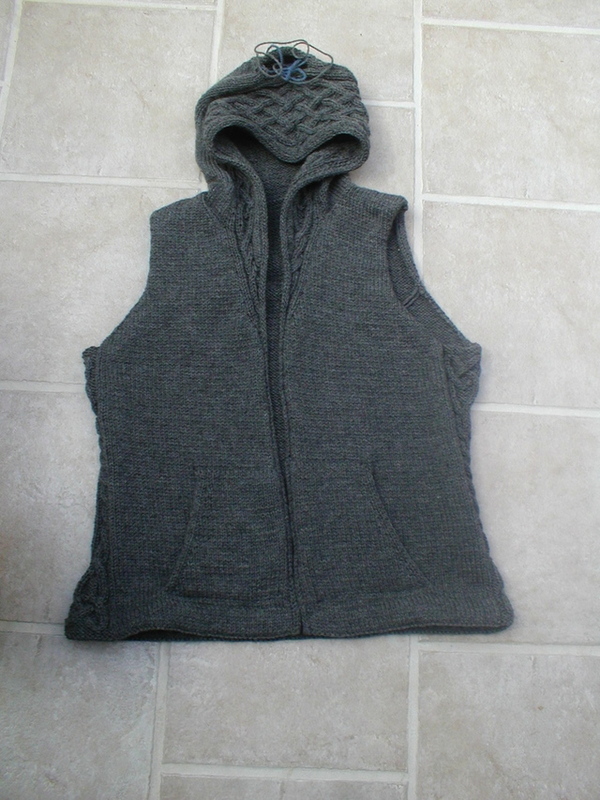 And it is indeed a surprise when you finish knitting this odd shaped piece and it folds nicely into a little jacket. I think I will try it next on worsted weight. This one will have little lady bug buttons if I can find them. One thing I’ve discovered about blogging is that you make rash comments and then feel you have to explain when you don’t follow through. Of course, I really doubt that anyone out there in the blogging world (all twelve of my readers!) are actually going to hold me to anything. The first of the year I mentioned that one of my goals for the year was to do more charity knitting and that I wanted to do at least one pair of socks a month for CIC. Well, so far I have finished one whole sock. No, not one pair, one sock! 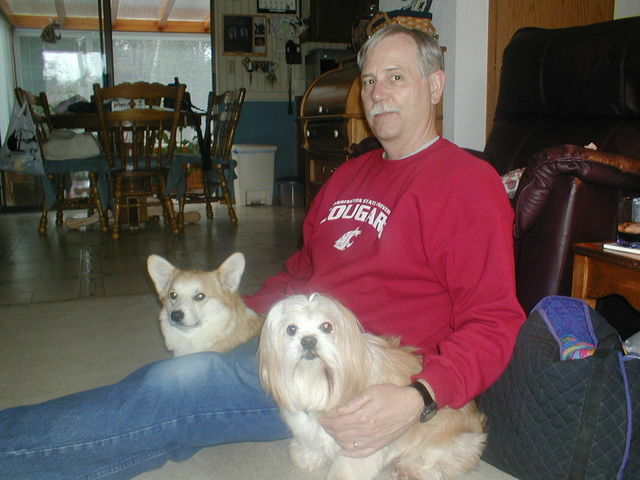 Of course, my FIL’s death in January put me behind on everything, but that’s not really the excuse. I have come to the realization that I’m just not that fond of knitting socks. It’s not the dreaded “second sock syndrome”, it’s actually the “first sock syndrome”. I don’t mind making a pair occasionally, especially those designed by Marguerite, but as a regular past time, I’ve come to the decision it’s just not my cup of tea. 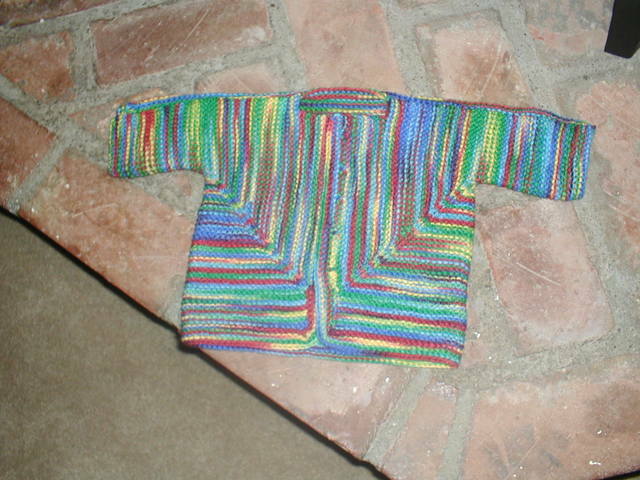 SO – I am redirecting my charity knitting to the Guidepost Knit for Kids Project. We’ll give this a try (“we” being the royal “we”, of course). This will make for some mindless car knitting, although car knitting for me doesn’t necessarily have to be mindless – a great deal of the Mediterranean Shawl was knitted in the car. But the first car show of the season was this weekend and I got a lot done on the trip and during the endless sitting around. The Knit Picks Alpaca Cloud is wonderful to work with. I’m finding the pattern fairly easy so far, although I have to keep the chart fairly close at hand. The only thing that I’m concerned about is that the design is not looking very clear at this point. It’s hard to tell because very quickly the project gets scrunched up on the needle and will look completely different once it’s stretched out. But so far the patterns don’t look as obvious as in the pattern picture. 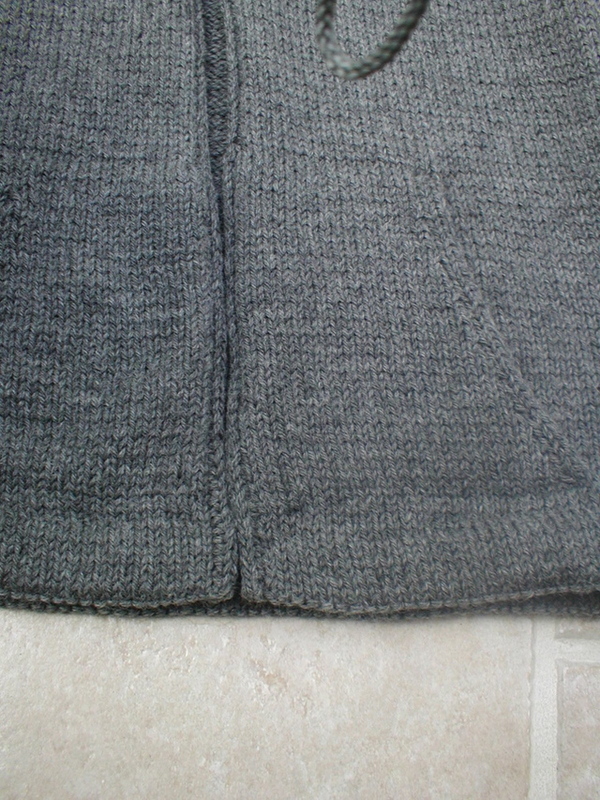 I think it’s because of the garter, rather than stockinette stitch, but am not sure. All said, I think I will keep plugging along and let the chips fall where they may. So far it’s been a relatively quick knit, but it’s getting exponentially larger as I go (it’s knitted from the neck down), so will start to slow down considerably. I finished putting on the attached I-cord border. This is the first I’ve done and I’m very pleased with it. And I’m especially pleased with the sewn cast-off – see how pretty? Thanks to Eilene for pointing me in the right direction – EZ, who else? And, only two weeks to go now before we get our new little puppy. She was spayed yesterday and came through with flying colors. Ten days of recovery and she will be ours. Kirby is oblivious to how his little life is going to change! I think it might be a shock at first, but he spent the first 9 years of his life with another dog and I think (hope) will adjust quickly.